IL LEE is celebrated for his pioneering work with ballpoint pen that began 40 years ago and continues today. Lee’s work, with its unorthodox media and distinctive style, and artistic contributions have received worldwide recognition. In his recent acrylic and oil works on canvas, Il Lee offers a counterpoint to his well-known ballpoint pen work and continues his early investigations of materials and process that began decades ago. Lee’s oeuvre offers a great breadth of approaches and media as he investigates drawing, the negative and its positive, line and form and of what is rendered and what is there but not rendered. Lee’s monolithic focus has created a universe at once cohesive and yet still expanding in all directions. Critically acclaimed and widely exhibited, Il Lee’s acrylic and oil on canvas work and his ballpoint pen on paper work were exhibited at The Metropolitan Museum of Art, New York, in 2010-11. Il Lee’s innovative and historically grounded ballpoint pen works were the subject of a mid-career retrospective at the San Jose Museum of Art and solo exhibitions at the Queens Museum of Art, the Vilcek Foundation, and the Crow Museum of Asian Art. His work has been exhibited at numerous museums, including The Aldrich Contemporary Art Museum, Brooklyn Museum, Smithsonian Museum of Art, Palms Springs Art Museum, Arkansas Arts Center, and National Museum of Modern and Contemporary Art, Korea. Works by Il Lee are represented in major collections including The Metropolitan Museum of Art, Minneapolis Institute of Art, San Jose Museum of Art, Palm Springs Art Museum, Vilcek Foundation, National Museum of Modern and Contemporary Art Korea, Leeum Samsung Museum of Art (Seoul), and Société Bic (France), among others. Reviews and feature articles about Il Lee have appeared in major international publications including the New York Times, New Yorker, Artnews, Art in America, Art Asia Pacific, San Francisco Chronicle and Newsweek. Il Lee is featured in The Metropolitan Museum of Art’s The Artist Project, an online video series exploring the museum’s collection, as well as in the book The Artist Project: What Artists See When They Look at Art, published by Phaidon, London (2017). Born in 1952 in Seoul, Korea, Il Lee has spent most of his adult life as an artist in New York City — his home since 1977 and where he developed his signature process and style using ballpoint pen, a medium important to his practice over the decades. “In many ways, Lee is a godfather of ballpoint art. Along with Alighiero Boetti and Jan Fabre, he was one of the first artists to dedicate years of his life to the intense study of ballpoint as an art-making device…. And even though Lee has been working with ballpoint for well over three decades, he is nowhere near finished experimenting with the medium. ” –Trent Morse, Ballpoint Art, Laurence King Publishing, London, 2016. IL LEE: New Printings/40 Years in New York. 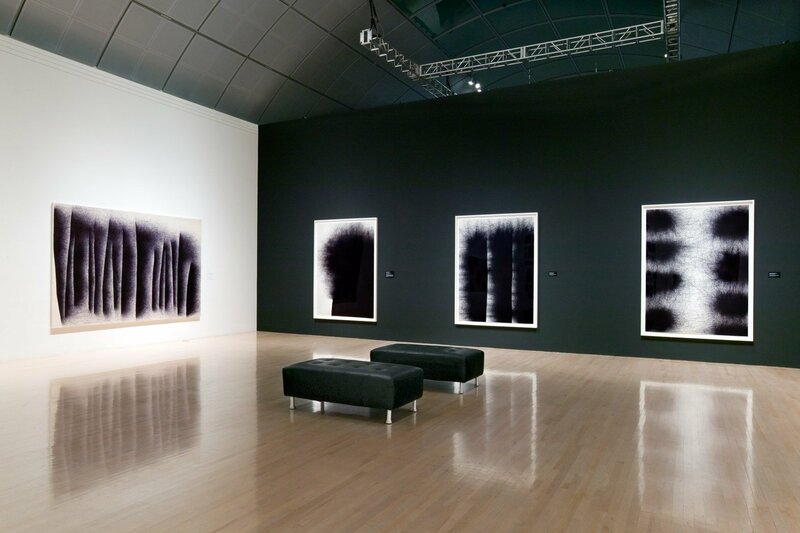 Image: Installation view of IL LEE: Ballpoint Abstractions at the San Jose Museum of Art, 2007. © 2007 Sue Tallon Photography; Courtesy of the San Jose Museum of Art.